No change in the individual slab and tax rates. Surcharge to be increased from 12% to 15%, when the total income exceeds INR 1 Crore per annum in case of individuals. 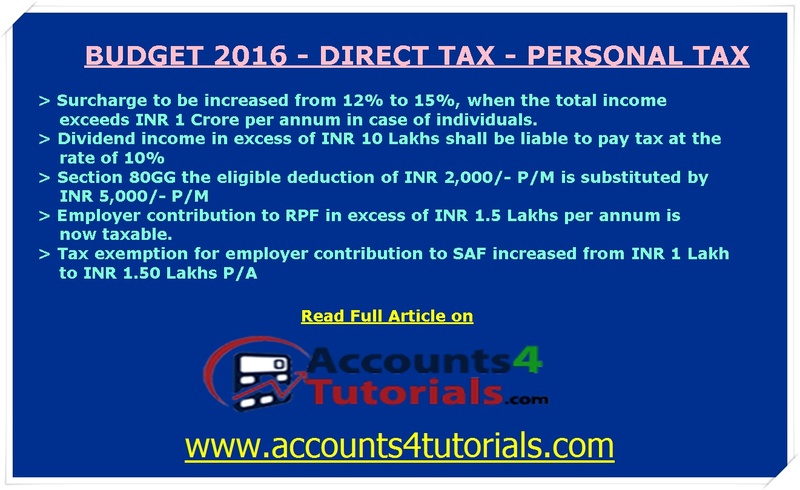 Employer contribution to RPF in excess of INR 1.5 Lakhs per annum is now taxable. Tax exemption on withdrawal now limited to 40% of accumulated balance attributable to contributions made on or after 01.04.2016 by an employee. Salary limits to be separately prescribed for employees excluded from tax on such withdrawal. Tax exemption for employer contribution to SAF increased from INR 1 Lakh to INR 1.50 Lakhs per annum. Payments in lieu of or commutation of annuity purchased out of contributions made on or after 01.04.2016, in excess of 40% of the annuity, are now taxable. Tax exemption now available for 40% of the amount payable at the time of closure or opting out of NPS. Amount received by nominee from NPS on death of assessee to be considered wholly exempt from tax. Section 24 has been amended to provide that an assessee is now eligible to claim deduction of interest paid on construction of self-occupied property of upto INR 2 Lakhs if the said construction is completed within 5 years as against 3 years under the existing provisions. Additional interest deduction of INR 50,000/- p.a. shall be available to a home buyer, not owning a home as on the date of sanction of the loan, for housing loans up to INR 35 Lakhs sanctioned between April, 2016 to March, 2017 and value of the property not exceeding INR 50 Lakhs. Deduction of 30% now available in respect of subsequent realisation of un realised rent also with arrears of rent. New Presumptive taxation scheme introduced for professionals - Individual, HUF or Partnership Firm (excluding LLP). Persons engaged in specified profession and whose gross receipts do not exceed INR 50 Lakhs shall have option to determine their income at the rate of 50% of gross receipts. If the taxpayer wants to offer profits and gains lower than 50% and the total income exceeds the maximum amount not chargeable to tax, the taxpayer would have to maintain books of account; get them audited and furnish a report of such audit. LTCG on transfer of a residential property shall not be chargeable to tax, if such gains are invested in subscription of shares of a company which qualifies to be an eligible startup subject to the condition that the individual and HUF holds more than 50% shares of the company and such company utilises the amount invested in shares to purchase a new asset before the due date of filing the return of income by the investor. Resident individual, HUF or a firm earning dividend income in excess of INR 10 Lakhs shall be liable to pay tax at the rate of 10%. With effect from 01.04.2017 and shall apply from AY 2017-18 accordingly. In order to bring uniformity in tax treatment with a firm or a company, it is proposed that any shares received by an individual or HUF as a consequence of demerger or amalgamation of a company shall not be chargeable to tax under Income from other sources. With effect from 01.04.2017. For the purpose of Section 80GG the eligible deduction of INR 2,000/- per month is substituted by INR 5,000/- per month with effect from 01.04.2017. For the purpose of Section 87A, the eligible deduction of INR 2,000/- is substituted by INR 5,000/- with effect from 01.04.2017.